With a new month comes a new list of purchases I'd like to make, especially with all the new beauty launches right now! 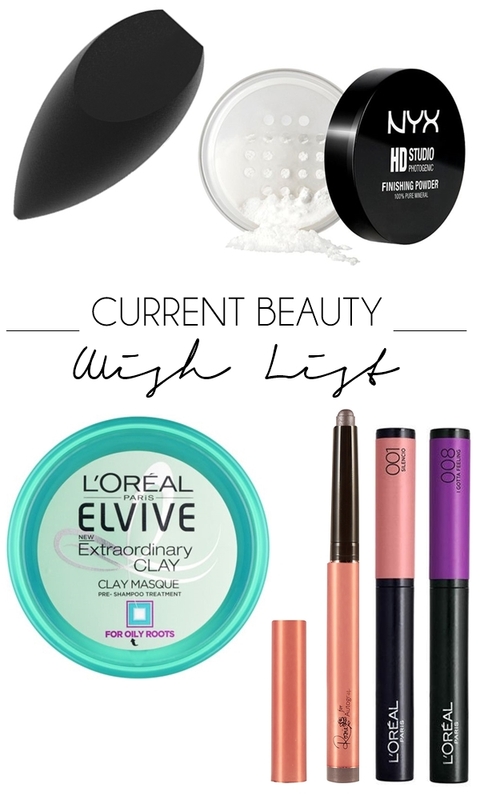 Here is my constraint beauty wish list that includes a few must-buys for everyone I think. For the last few years I've loved using blending sponges to blend my foundation with, so this new type of sponge instantly caught my eye. Unlike other sponges it's designed to be used dry (and wet if you want to blend with it) as a guide for eyeliner and eyeshadow, a smudger for the lower lash liner and even to be dipped in makeup remover for corrections! So this is a truly multi-functional sponge. I'm so eager to give this a go! Finally NYX have come to ASOS!! Yes, I know it's already on Boots but I don't rate their click & collect service and ASOS is free delivery - so I'm excited! Other than wanting more than a few items from NYX, their Studio Finishing Powder is calling to me as I've recently got into baking my makeup (I apply a ton of powder to my under eye area, 'bake' it for 5 minutes, then sweep it away, for a brightened concealer eye that lasts all day!) and I know this has raved reviews due to being ultra fine. In fact a few beauty bloggers claim it's better than MUFE HD Powder. I basically need this in my life! So many exclamation marks here... I apologise. I recently mentioned this product as one of my Predicted Beauty Product Trends of the year as I really think we are going to be seeing a lot of these pre-wash treatments in the next few months. I've actually been looking in Boots stores for the past two weeks for this product as a oil-absorbing pre-shampoo treatment for my roots seems exactly what I need, but I've yet to find it. Hopefully I can find it this month as I'm really hoping it will work wonders on my often lank hair. At the weekend I watched Lisa Eldridge's amazing makeup tutorial with Rosie Huntington-Whiteley (you can watch it here on YouTube) and aside from marvelling at Rosie's natural beauty I was lusting after a few makeup pieces from her new collaboration with M&S. The makeup range very much has a Charlotte Tilbury vibe about it but for less than half the price and the Cream Eyeshadow Sticks are very By Terry. Hoping to pick up both 'Almond Eyes' and 'Feline Fox' soon. Ohhh, now this is a new product launch that has me in intrigued! These new L'Oreal matte lip colours are actually a powder matte product in a dip pot style packaging. I can't wait to try out the shades above; Silenco and I Gotta Feeling. If you've tried these already I'd love to know what you think of them! What are you most wanting to pick up this month?